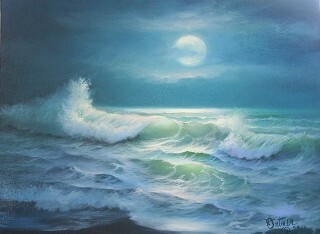 Kathie teaches Seascape workshops at Butterfly Kisses Studio in Clermont, FL For directions to the studio, click HERE. 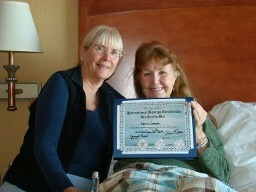 Kathie Camara is a Certified International Joyce Ortner Seascape instructor. 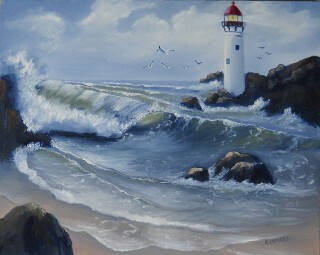 She has painted many times with and recently (Jan. 2014) completed a 3 week intensive oil painting workshop with Joyce Ortner. This course reinforced the fundamentals of good art: sketching, values, color and temperature and also stressed making seascape paintings atmospheric. As a special treat, Ran Ortner, an award winning New York seascape artist and Joyce Ortner's son, taught part of the workshop. Ran does not teach workshops, so Kathie feels very priviledged to have studied with him. 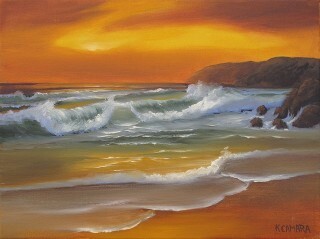 She has also studied with other seascape artists such as Brenda Harris, E. John Robinson, Byron Pickering to name a few. Workshops are offered to ages 14 and older, but if you are already a student of Kathie, younger than 13, talk with Kathie to see if you are 'ready' to take a workshop. Fee: $150.00 11 X 14 canvas, paints & mediums supplied. Pay here with PayPal or Credit Card. Please remember to put the NAME & DATE of the workshop in your memo.